When it comes to choosing a rifle scope there are many factors that you should consider, but when you are choosing the best handgun scope, the number of factors increases significantly. It’s hard to throw a rock and not hit some company offering some new riflescope, or some other latest and greatest optic. When it comes to handgun scopes though, you are going to see far fewer competitors. The reason is that handgun scopes have a very tough job to do, and they have a few more obstacles to overcome before they can even do their job. Handguns recoil in a different way than a rifle. This unique muzzle rise of the recoil will change the effects the recoil has on a scope when compared to a rifle or shotgun. Also, due to the gun not being braced against your shoulder, the shock of the gun firing is fully absorbed by the gun, and not transferred to your body. Your hands simply hold onto the gun while it recoils, instead of allowing the shock to travel down the stock of a rifle and into your body. 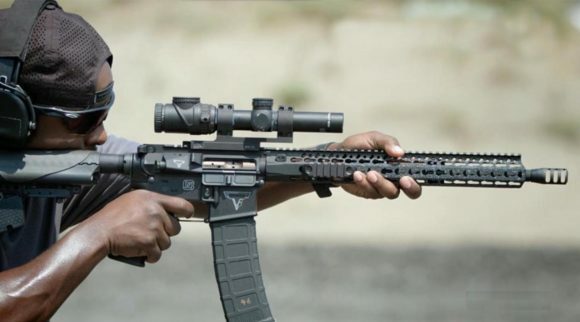 All of this means that manufacturers have to design handgun scopes specifically to survive the shock of a handgun; they have to be built differently and to withstand different things than a riflescope would. Otherwise, the recurring shock would knock the scope off its zero and cause the aim point to be off target. When it comes to selecting a handgun scope you want to make sure that the scope has been tested and is guaranteed against the caliber of gun you are wanting it for. If not, then you can read through reviews and see if others have used the scope for that caliber of weapon and see their results. This is especially true for the larger, magnum rounds such as the 500 S&W or the .454 Casull. These rounds produce an enormous amount of energy, and need scopes specifically tested to withstand the extra stress. Another challenge for a pistol scope is eye relief. Eye Relief is the distance that the scope can be from your eye that you can still see through it clearly. If you get outside of this range, you will see black surrounding the bright center, and you cannot aim effectively. Most rifle scopes have a three- to seven-inch eye relief. 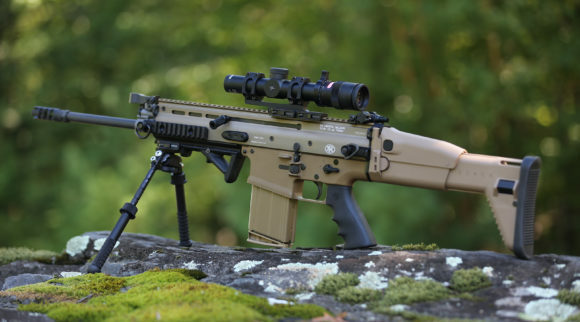 This range is far too short for a pistol scope, considering most shooters hold a pistol 18 to 25 inches from their eye. So, handgun scopes are designed to have an increased eye relief. The problem comes with the fact that not all manufacturers have the same extended eye relief. So, you must check to see what eye relief you need, and then make sure that any scope you consider has an eye relief in that range. To measure your eye relief, stand with your pistol extended in a comfortable stance, and have someone measure from the back of the gun to your eye. This measurement will give you an idea of what range of eye relief you need. Another struggle for handgun scopes is field of view (FOV). Field of view is the area you can see when looking through a scope. There are a few factors that affect a scope’s field of view, with magnification be the leading one. Without a large enough field of view, it can be hard to locate your target in the scope. Just imagine if you are looking through a hole punched in a large piece of cardboard. The closer the hole is to your eye, the larger the amount of area you can see. Handgun scopes struggle with FOV, and that can make it difficult to draw the gun and get a good sight picture. This is not really a concern if you are target shooting, or if you are hunting from a tree stand or ground blind where you have plenty of time. If you are hunting in grizzly bear country, and are facing a charging momma, it suddenly becomes a major concern. Regardless of what you are shooting at, however, being able to see the target, and get a sight picture lined up rather quickly, is always a priority. When it comes to attaching the best handgun scope to your gun, your choice of equipment and method can have a tremendous impact on your success with the scope. 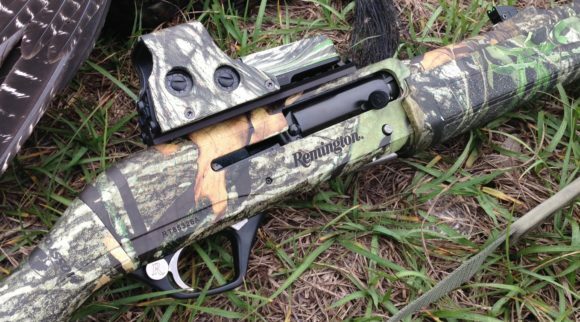 Mounting is one of the primary reasons people have difficulty sighting in their rifles. 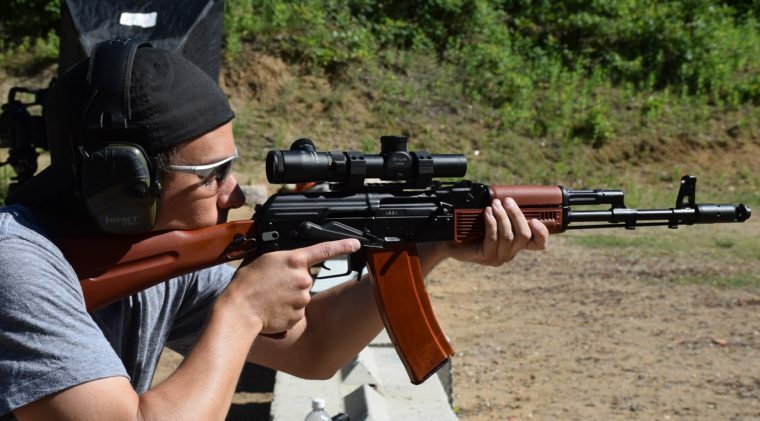 People will bring their guns into a gunsmith saying that they can’t get their scope zeroed, and often the gunsmith can pull the scope off with their hands. When dealing with handguns this becomes even more important due to the extra stress added to the scope during the recoil. Also, handguns are often handled rougher than rifles, meaning the chances of the scope taking a bump or ding are increased. You need to make sure that you are using a good quality, heavy-duty set of scope rings. It is essential to check and make sure that the rings have a sound bite onto the scope rail, and that the teeth are fitting snugly in the groves. You also want to make sure that the rings fit the gun and scope properly, and that everything lines up without having to be forced into place. When you are tightening the screw down, you need to run both until finger tight, and then turn each no more than three to four turns, before moving over to the other side. Tightening in this manner allows both rings to tighten at approximately the same time, and ensures the scope is not being torqued in one direction or the other. It is widely recommended by gunsmiths to use a locking compound on the screws of the scope rings. This compound fills the spaces that remain in the threads and helps ensure a secure hold and prevents the screws from loosening and backing out from the vibrations during recoil. Once completed, the scope should be firmly attached to the gun, and you should not be able to wiggle or move it in any way with your hands. 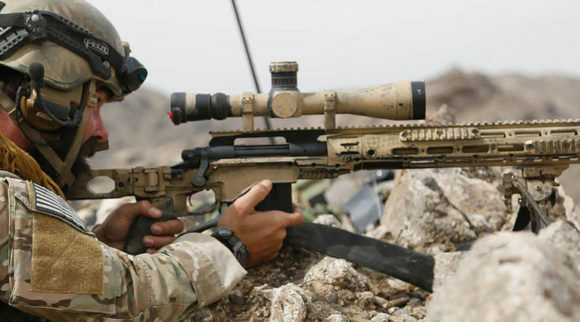 Making sure your scope is appropriately mounted will allow you to zero the scope and know that it is going to be accurate when you need it to be. The scope must also be level. 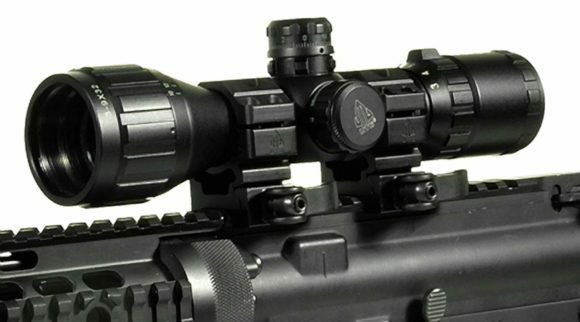 When mounting the scope, any imperfections in the rings or the gun’s rail, as well as any foreign objects that get between the two, can cant the scope in one way or another. Using a button level, you can make sure everything stays square as you tighten the mounts down. When you choose to scope a handgun, you are going to have to answer some basic questions to start narrowing down the field of possibilities. 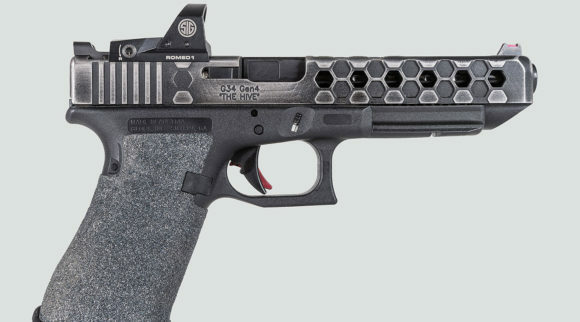 Since the world of handguns brings a different set of variables to the table, the selection process is not the same as it would be for rifles. One of the first things you will need to know is what gun you are going to be putting the scope on, and specifically what type of action the gun has and the caliber of the gun. 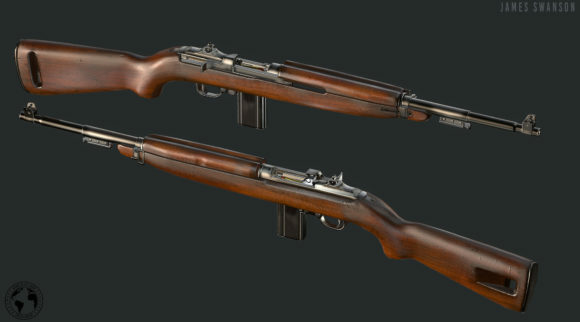 As mentioned above, handguns have unique recoil considerations when compared to a rifle. Revolvers will have a significantly different recoil profile than an automatic or a break-action handgun would have. The way the scope mounts to the gun would also be different, and the mount itself could be a limiting issue. The second part of this is the caliber on the gun. 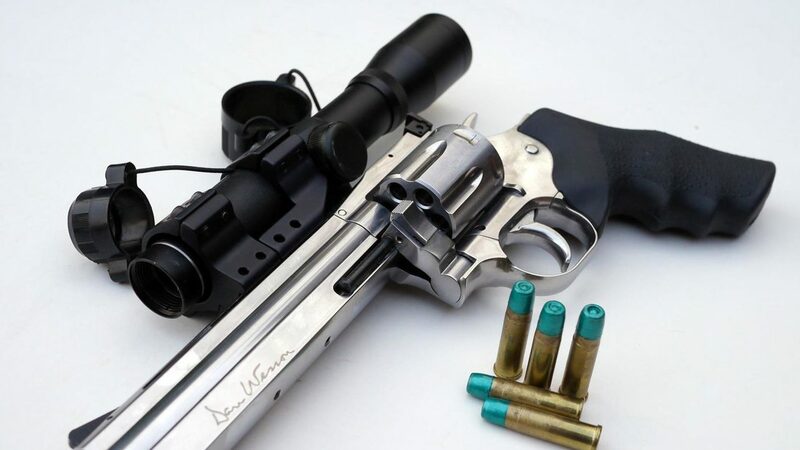 Small caliber guns such as .22lr and .22 Magnum will not have the recoil of the heavier magnums but will have a specific vibration pattern that will usually require a specific type of scope. Likewise, the heavier magnums will require stronger scopes that are rated for the extreme recoil. The magnification of a particular scope can be a primary determining factor when choosing your next purchase. There are two options when selecting magnification of a scope, either fixed or variable. Both have their advantages. With a variable magnification, you can adjust it to fit whatever circumstances and shooting conditions are present. The fixed power scopes are generally considered to be “tougher” and can handle more abuse since there are fewer moving parts. It’s also important to make sure that the field of view of a specific scope is not too narrow for your shooting conditions. 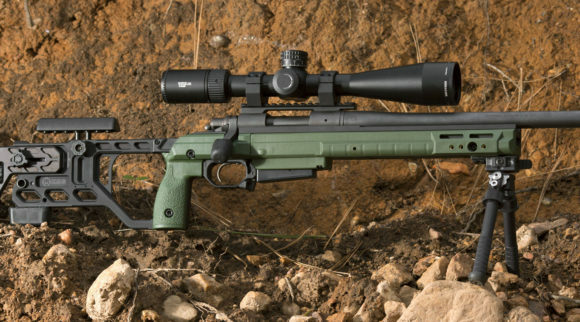 If you choose a higher-powered scope, it may be very difficult to shoot at or below 100 yards. What you choose to do with the gun can make a big difference when choosing the best handgun scope. Like I mentioned above, the field of view can be a significant factor if you are going to be using the gun for hunting. When you are on the range you can take longer to find your target, and the surrounding area is not as important. In the woods, you need to be able to see the area around your target as well. Leupold is one of the best optics manufacturers in the world, and they have been designing and manufacturing some of the best scopes in the world for many years. So naturally, Leupold makes one of the best handgun scopes on the market. The Leupold FX-II – 4X x 28mm Compact Handgun Scope is easily one of the best available options for any handgun. 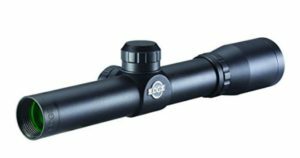 This scope is rock solid, offers a clear sight picture with fantastic light gathering capability, and is 100% fog proof and waterproof. The scope is built using multi-coated lenses which include Leupold’s DiamondCoat, a hardened coating for scratch and abrasion resistance, to make sure you have as much available light as possible. With a bright sight picture and extreme clarity, the view is distortion-free and easy to see. This, combined with the generous eye relief and open eyebox, will help you get on target fast. The FX-II scope is made with Leupold’s Proprietary nitrogen sealing process and is 100% fog proof and waterproof. The VX-2 is also backed by Leupold’s lifetime warranty so you can purchase and hunt and shoot with confidence. If you are looking for a handgun scope, it would be very hard to find a better all-around option than the Leupold FX-II. The Simmons ProHunter Handgun Scope with Truplex Reticle in a variable 2-6X x 32mm is a fantastic all-around solution for a handgun scope. 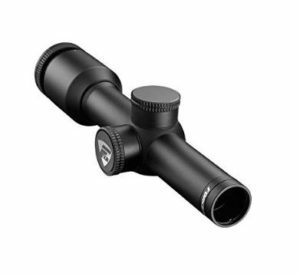 With a variable power setting from 2X to 6X, this scope allows you to dial in the magnification you need. 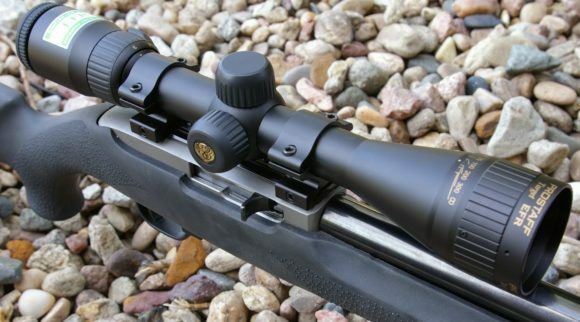 The ability to adjust the magnification makes this scope ideal for hunting. The ProHunter has high-quality optics with HD clarity. It is durable and built to last, with shockproof construction, multi-coated optics, and high-quality glass. It features Simmons’ TrueZero windage and elevation system that works to lock in your zero and maintain it through your hunt. This scope has been tested to be waterproof, fog proof and recoil-proof through 1,000 rounds of .375 H&H magnum. Next on our list is the Bushnell Trophy Handgun Scope with the Multi-X Reticle. 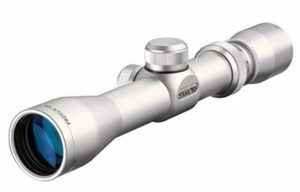 This scope was designed to offer superior clarity and excellent light transmission. The scope is available in many configurations to allow you to customize your experience. 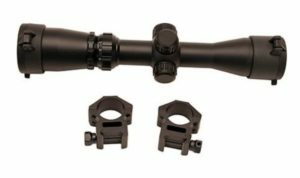 This scope features a shortened main tube and fully multi-coated optics which help provide an incredibly bright sight picture. Bushnell’s RainGuard HD lens coating makes sure that the lens stays clear in any weather, and the fast focus eyepiece makes target acquisition a breeze. The Trophy series scopes also have a side parallax adjustment that allows you to dial in your zero based off the range of your shots. Bushnell offers an excellent “no questions asked” lifetime warranty, so you know that no matter what, your scope is covered. If you are looking for an affordable yet high-quality handgun scope, then the Bushnell Trophy series is right up your alley. Number four goes to another Simmons ProHunter series scope. The Simmons ProHunter 4x32mm with Truplex Reticle. 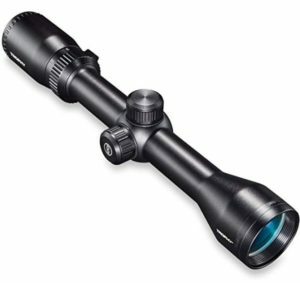 This scope is much like the variable power 2-6X x 32mm that is number two on our list but is a fixed 4X power scope. The difference between fixed power and variable power scopes is that one has a fixed magnification level, while the other can be adjusted through a range of magnifications levels. Which is better depends on the personal preferences of the shooter and the situation that the scopes are intended to be used for. For a hunter, being able to adjust your magnification levels means that you can adjust to taking shots at different ranges easier, which is nice since you have no idea where the animal is going to appear. For a target shooter, having a fixed power scope means that you will have the same sight picture and the same field of view on every shot. As many target shooters will tell you, consistency is vital. The Weaver Classic 2x28mm (849424) Handgun Scope is one of the most basic handgun scopes available on the market but has provided years of service to hunters and target shooters alike. The scope has a dual-x reticle with 1/4 inch MOA adjustments and is made from high-quality materials. The Weaver Classic features fully multi-coated lenses to provide excellent clarity. The scope is built on a one-inch, single piece main tube that has been nitrogen purged to eliminate fogging. The scope is also waterproof and shockproof, being tested to withstand the most powerful handgun calibers. The scope comes set with a 50-yard parallax. 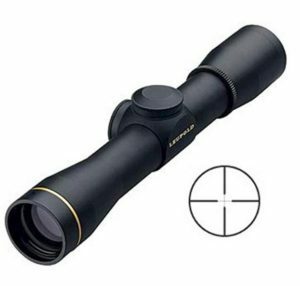 This scope is perfect for a hunter that is looking for a simple, no-frills optic that helps with aiming while providing some magnification. The Weaver Classic is a good fit for any handgun and will work with any type or style of shooting. The Nikon 8470 Force XR 2x20mm Pistol Scope with the Nikoplex reticle is another handgun scope that takes the approach of performing the basic requirements of a scope (adding crosshairs for accurate shooting while providing at least minimal magnification) and focuses on doing them very well. 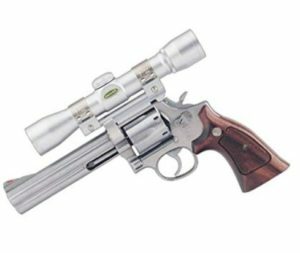 With a long eye relief, rugged construction, multi-coated lenses, and quick focus eyepiece, this scope is built to handle the abuse and unique situations handgun hunters are faced with. The Force XR also features Nikon’s Ultra Clear Coat Optical System which helps improve light transmission up to 95%, providing a clear and bright sight picture. The scope is sealed and is waterproof, shockproof, and fog proof. It has been field tested to withstand all handgun calibers, including the S&W 500. This scope features Nikon’s Nikoplex reticle, Nikon’s premier bullet drop compensation (BDC) reticle for handguns. This reticle allows you to quickly gauge your holdover for longer range shots, which still providing an unobstructed sight picture. If you are wanting to hunt with your handgun and don’t need high levels of magnification, then the Nikon 8470 Force XR 2x20mm Pistol Scope is perfect for your setup. With a name like Nikon, you can expect not only high quality but also top of the line warranty and customer service. 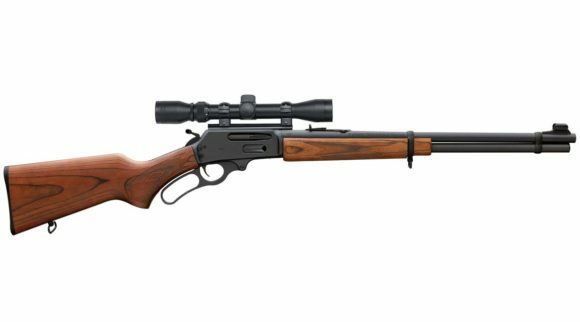 Up next at number 7 is the BSA 2X20 Edge Series Pistol Scope. The BSA Edge Series is designed to be an affordable, barebone, and simple optic that helps you with accuracy by providing crosshairs for aiming instead of iron sights. The scope is a fixed 2X power, which is the lowest magnification available. It also has a 20mm objective, so it is small and sleek. It weights only 12 ounces and is 9.2 inches long. If you have trouble shooting accurately with iron sights and need a better aiming point, then the BSA 2X20 Edge Series Pistol Scopes is an optic to consider. The final scope on our list is the UTG 2-7X32 1″ Handgun Scope with the PDC Illuminated Reticle. 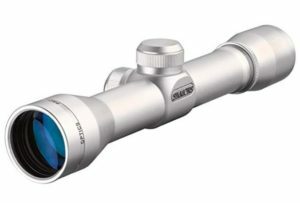 This variable power scope allows the shooter to dial in the magnification from 2X to 7X. Being able to adjust the magnification means you can better adapt to a varying range of shots, which is ideal for a hunter. The UTG features a long, up to 25 inches, eye relief to allow you to adjust for a comfortable stance. It also features UTG’s Projectile Drop Compensation (PDC) Illuminated Reticle. This reticle is illuminated, and the scope has a side adjustment to cycle between red, green, or black. The scope also comes pre-adjusted to 35 yards. It is built on a single piece one-inch main tube and is O-ring sealed. This scope is 12 inches long and weighs 1/3 pounds. It comes from the factory with AccuShot rings and flip-open lens caps. The scope is completely sealed and filled with nitrogen and is waterproof, shockproof, and fog proof. If you are looking for a good quality yet affordable variable power handgun scope, then the UTG 2-7X32 1″ Handgun Scope is an excellent choice. We hope this collection of the best handgun scopes is helpful. Remember to keep in mind which type of handgun you have, the caliber, and what kind of shooting you plan to do so you can pick the best scope for your handgun.